I entered this miniature into The Color of White Challenge, posted by Susan Abbott on Daily Paintworks. It is my second piece. My first sold this past Thursday. 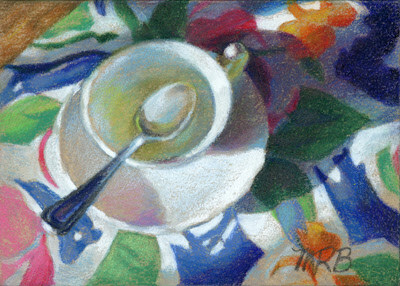 Missed You For Tea, although small, was a complicated piece that took approximately four hours to draw. This is so sweet, but sort of a sad commentary on a friendship. A lot can be said and felt over a hot cup of tea. Actually, I am glad that you picked up on the sadness. The tea cup (which in reality is very decorative) was bought for my Grandmother (for whom I am name after) by my father when he was stationed over in England. After his mother passed, it and many other tea cups were given to my mother. Before she died, she wanted me to have them, and I miss her terribly! Hence the title and the remembrance of loved ones past.